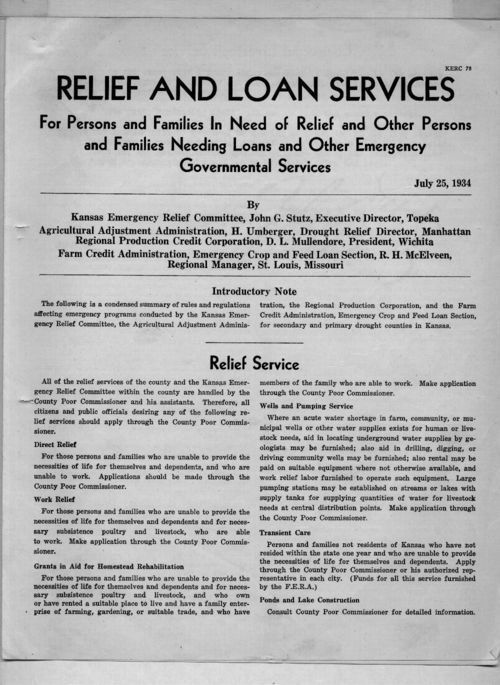 This pamphlet, which appears to have been distributed to relief clients, is a condensed summary of the government relief programs handled by the Kansas Emergency Relief Committee (KERC), the Agricultural Adjustment Administration (AAA), the Regional Production Credit Corporation, and the Farm Credit Administration (FCA). It describes work relief, direct relief, grants for homestead rehabilitation, the cattle purchase program, and feed and forage loans meant to benefit drought relief counties in the Dust Bowl. This document would work well as an introduction to this standard because it could be grouped with a variety of items (including both images and documents) that discuss relief efforts during the 1930s. It would work particularly well with the case files of families on relief and the selected image of cattle purchased under the cattle purchase program.